I recently heard of a technique on the Two Hoziers podcast that the podcast hosts initially called "faux medium format." The basic premise is that the photographer can create images with impossibly shallow depth of field by using a telephoto lens and stitching together multiple images. The photographer is able to increase the field of view from a telephoto angle to a wide angle while maintaining optical qualities of the telephoto lens. Since that initial discovery of the technique I have also heard the technique called "The Brenizer Method" or "bokeh panoramas." I am particularly fond of the "bokeh panorama" moniker for the technique because it seems to be the most descriptive. 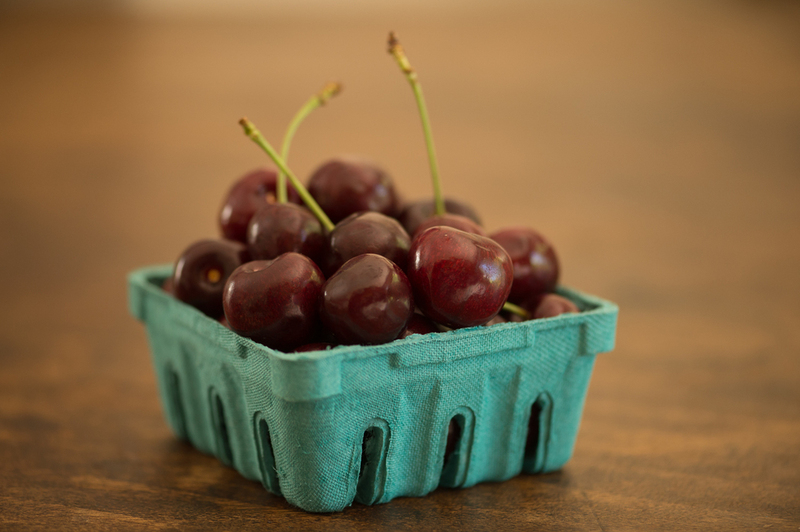 Bokeh refers to the creamy out of focus portion of the image that is created by very wide apertures on certain lenses. Using a tripod for support, stabilization, and maintenance of the nodal point, the photographer captures a sequence of overlapping images. Care must be taken during capture to ensure the same exposure and focus are maintained throughout the sequence. The photographer captures the entire scene he or she wishes to appear in the final image. These three images are original capture frames from the creation of the final "Cookies" image above. Once the series of images has been captured the photographer uses Photoshop or specialized panoramic software to stitch together the multiple images into one large image. To ensure that the stitched image appears visually cohesive the photographer must correct the individual image files for lens distortion and vignetting prior to stitching. Panoramic stitching is a common technique used by landscape photographers to increase the field of view and the effective resolution of the final image. The Brenizer Method is most often used by portrait photographers to achieve impossibly shallow depth of field portraits, and to create very high resolution images. My goal with this image series was to create a series of still life images that employ this use of both a wide field of view and a very shallow depth of field. To my knowledge, this technique is not commonly used for food photography or still life photography and I wanted to explore what was possible. The images I create will be tablescape sets of food with a shallow depth of field, only the “hero” item in sharp focus with the rest of the image falling out of focus. Overall, what I learned most from this process, besides the ability to technically create the images, is that many images do not benefit from this method. The technique very significantly reduces the depth of field in the frame. Sometimes that reduction helps to focus viewer attention on the "hero" item, but sometimes the area in focus is just too small and it becomes distracting to the viewer. I created several tableaus that simply did not work. Will I do this in the future? The short answer is maybe. For now, I'm happy with more traditional image capture techniques for most of my food photography. This post is part of the On Our Plates blog circle. Please check out Jana's yummy pasta post and follow the circle to see lots of great food photography and recipes. For the last few months I have been trying to schedule and shoot a personal, styled food session. I will usually pick something that looks yummy at the grocery store or at the bakery as a subject. Every once in a while I will get inspired by something I've seen on Pinterest. I keep a board of food photography inspiration just for that purpose. I try and produce enough images from this food shoot to create a set of three images to add to my Instagram feed. This recipe is a little twist on the classic Bruschetta recipe. This recipe features a healthy dose of garlic and a splash of balsamic vinegar at service to pep up the traditional Italian appetizer. For his birthday my son Adam picked these cute, easy S'more Treats to share with his class. They are super easy to make and can be prepared a day or two in advance. You only need three ingredients and stick. First, I have to admit that this isn't the cake I was going to photograph. The cake I wanted to photograph is Great Dane Baking Company's Blue Velvet Cake. It is a luscious cake with swirls of perfectly white buttercream. It's beautiful. But...the day I went to get one all the cakes in the case had slight imperfections in the icing. The sides had bumped into something. And that just wouldn't do. So I grabbed this beauty, the Mocha Cake. See my "helper" peeking in behind the cake. This cake is layers of chocolate cake with a light and fluffy mocha mousse. The top is drizzled with melting chocolate and the edges are lined with chocolate pieces. As with many food shots I had a vision in my mind of what I wanted to show the viewer. I waned to show off my new cake stand, but I also wanted a deep moody feel to the image. This capture shows the details of the cake decoration, but wasn't the mood or angle I was looking for. A cut shot of the cake. I realized too late that I would have preferred for the cake to be positioned on the plate the other way (frosting toward camera right). Final shot: the keeper. This image shows the mood and detail that I wanted. While the cake is not shown in whole, I think the light falloff in the shadows adds depth and dimension to the shot. This post is part of the On Our Plate series. Please check out Aerie Photography's Teriyaki Salmon! Tags: food, cake, cake stand, styled shoot, window light, Great Dane Baking Co.
My preference for food photography is to work with natural light. I have a huge north-facing picture window in my dining room that is perfect for great, natural food shots. My challenge for these photographs was to emulate the Renaissance still life paintings using electronic flash. I love the shape of these and the texture of the fruit inside. 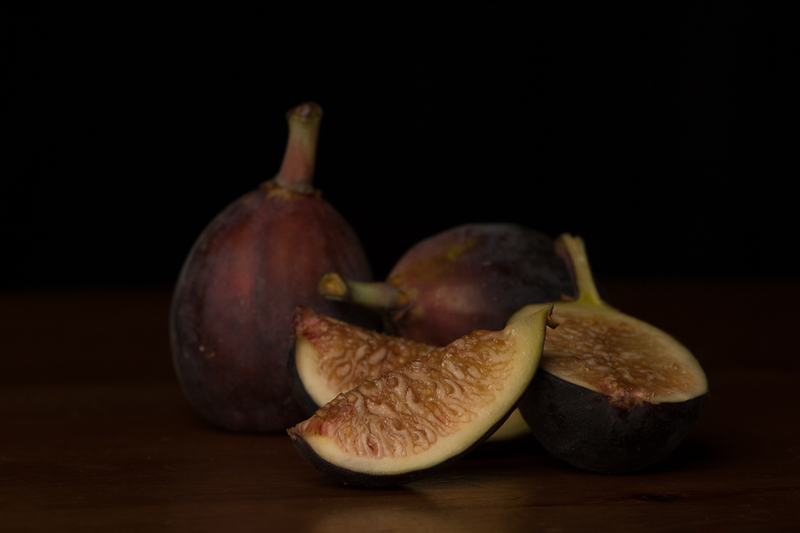 I love the glow in the tip of the stem in the whole fig. These make me want to make a home-made Bolognese red-wine sauce. There are so many great varieties of apple available today. My favorites are pink ladies, but galas are great, too. Nothing beats granny smith for pies. I'm not a wine drinker, so I was lucky to have an open bottle available leftover from a delicious chicken picatta I made the evening before. Head of garlic. I love the imperfection in the clove.